Cycling Ireland will be holding a National Youth Coaching and Training Day on 2nd July in Mondello Park, Naas, Co. Kildare. This is a great opportunity for all Youth cyclists go along, meet likeminded people and get a few training and coaching tips into the bargain. Are you a bike lover, under 16 years old, who wants to learn a little more? Cycling Ireland is inviting you to participate in a training camp on a closed road circuit that is normally used in car racing. 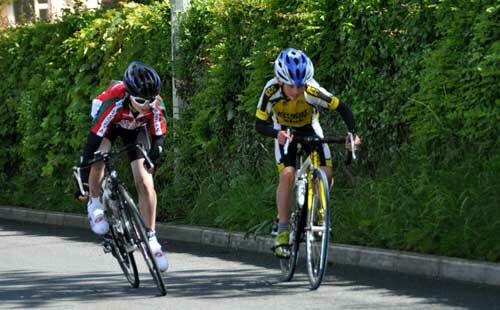 Newry Wheelers are hosting a Youth Racing day on 29th May with racing starting at 11am. This promises to be a great day's racing for all Youth and is another counter in the David McCall Foundation Ulster Youth League. Please see below for full details of venue and sign-on times. Emyvale Cycling club organised a very successful youth racing event, with a good quiet circuit, plenty of marshalls and good parking facilities. The first race was the U-12 group, which after 2 mile started to split on the long drag. Dean Chambers, Newry Wheelers tried to break clear but P.J Doogan, Errigal and Naoise Sheridan, Orwell closed the gap and this trio quickly established a break. The B Race for A4's will now cover two laps of the Nutts Corner Circuit before heading to the Divis Mountain climb. This will make the race approximately 35 miles but they will be tough miles especially on the final stretch. For full details and maps see previous story. There will be woman’s prizes in this race and it also ideal training for anyone contemplating doing Rás Dhun na nGall.. There will be Ulster U16 and U14 Youth Teams selected to participate in the 2011 Mayo Youth Tour which takes place from 30th July – 1st August. Cycling Ulster Youth Commission Chair George Boyd said “This is a prime target for youth racers across Ireland and from further abroad and Ulster will field representative teams for the event." Under 14s to be managed by Mary Boyd. Under 16s to be managed by George Boyd.